It’s that time of year again: the time when my stomach hurts and I just want to sleep all day. On this day 15 years ago my airline’s plane, a 767 that I flew on regularly, was overtaken by terrorists and flown straight into the World Trade Center. The leader of the horrific events of 9/11, Mohammad Atta, was someone I recognized from my flights. He flew as a passenger on our planes in order to learn the system and develop his plan of attack. A flight attendant never wants to think the worst of any passenger. How could we have known he was so evil? When I checked in for my flight on 9/10/2001 I had a weird feeling. My stomach hurt and I felt like something bad was going to happen. I remember even trying to explain to someone how I felt, “I feel like something bad is going to happen, but not to me.” I wasn’t fearful. I felt safe. But I just had a gut feeling that something was not right. I wish I could have done something useful with that tiny warning. *If you are reading this I would love it if you comment below. Tell me about where you were on that day. What is your emotional response now? Are you able to watch footage from that day? Are you able to visit Memorials? In the airline world, crew members are interchangeable. Any flight attendant who is trained on a particular aircraft can be assigned to work on that aircraft. If one calls in sick, there is another who is called to replace them. We all wear the same uniform and we all follow the same procedures. At work we are not individuals, we are the airline we are representing. That’s why passengers blame us when their travel day goes wrong and they’re looking for someone to take the blame. 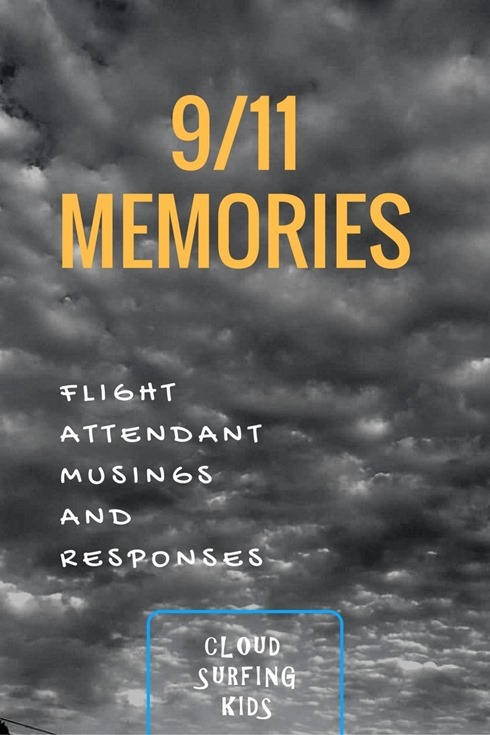 Because of this dynamic, when we lost crew members to the terrorist acts on 9/11, those crew members were the same as those of us who escaped the tragedy. True, we lived on through that day, so it wasn’t the same as if it was one of us, but it was close…so close…too close. Because of the dynamic of our interchangeable job, these crew members who were the first responders were our family. The loss of them made them even closer even if we had never met them. It’s hard to explain. As a flight attendant I’m always smiling…even if through tears. I was on a layover in San Diego on the morning of 9/11. I was scheduled to fly back to New York on a 12:45 pm flight, so I was still sleeping when the first plane hit the Towers. I woke up to a phone call from my dad. Not one to create panic, he calmly said, “Do you know what just happened in your city?” He didn’t even know if I was in New York, or if I was flying that morning. I imagine he probably let out a sigh of relief when he heard my voice answer the phone. I think he told me to turn on the TV. I think I might have watched the second plane hit the Towers live, but I can’t say for sure. The rest of that day and week were a blur. I spent five days stranded in San Diego then worked a flight back to New York. I didn’t mind staying in San Diego during that time. In New York I lived in a basement apartment in Queens. I was in no rush to get back to that gloomy place so close to Ground Zero, with ash and smoke still hanging in the skies. For about a month flying was really hard. I didn’t feel like flying was less safe, but the reminders of the tragedy had me (and all of the crew members) bursting into tears at inopportune times. Sometimes right in the middle of the meal service, or when making the announcement, “Welcome to New York” [racking sob]. Not very professional. Ever so difficult. But we got through it, because it was our job to put on a brave face and just continue to provide service and protect our passengers. Yesterday I laid down on my daughter’s bed and fell asleep so I could escape. When I woke up I looked out the window and watched the trees blowing in the wind. I imagined the wind being the breath of our beloved crew members who died on 9/11. When the breeze picked up it seemed angry. 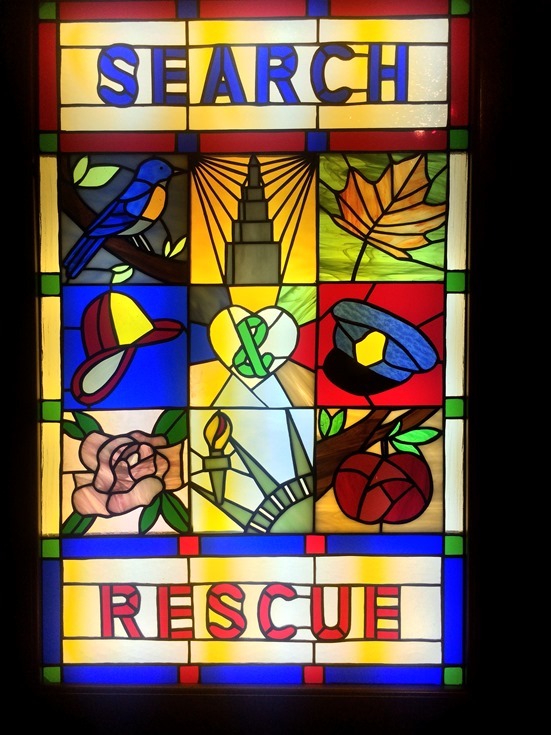 There are so many wonderful memorials and events recognizing the First Responders to the terrorist attacks on 9/11: Firefighters, Policemen, EMTs…but very few acknowledge the First Responders who were the very first responders. Flight Attendant Betty Ong used the in-flight phone to report what was happening. She maintained her professionalism to the end, using those last minutes to report such useful information rather than calling family and loved ones, as most of us would. Flight Attendants and Pilots aren’t even recognized as first responders at the 9/11 Memorial. 9/11 Family Members and Rescue Workers get free admission, FDNY/NYPD/PAPD get discounted tickets, but flight crews have to pay full price. There is more than a little bitterness about this in the airline world. Prices for the 9/11 Memorial…Flight Crew left out as first responders. ..I just took a moment and started reading the transcript of Betty Ong’s phone call…I can’t. It happened 15 years ago but it might as well have been yesterday. I can’t read it…. Recently another flight attendant told me that she was flying with a new hire who was just 20 years old. He was five when the tragedy occurred. He doesn’t really know about it. He told her, “Wasn’t it really just a set up? I don’t think it really happened.” Oh. My. Gosh. I don’t know how I would react if someone I was flying with told me that. I seriously don’t know. I really might punch them. *Note to young crew members: if you believe the conspiracy theory junk about 9/11 keep it to yourself. A few months ago I visited the NYC Fire Museum. 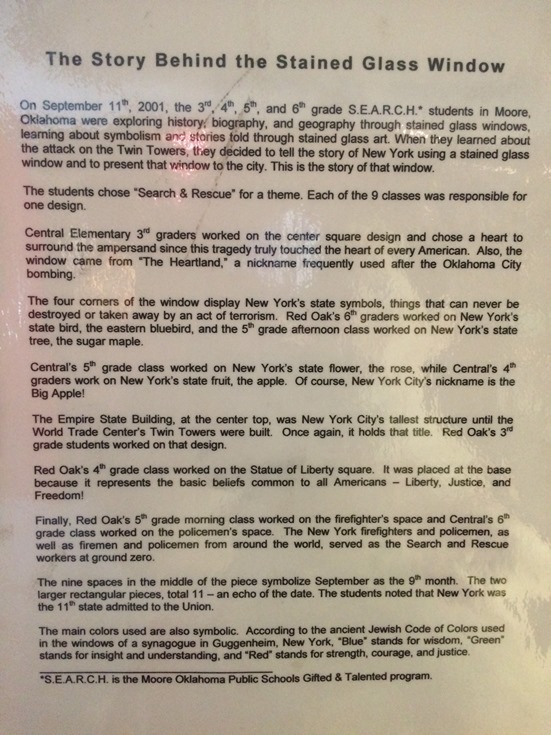 They had two rooms filled with 9/11 memorabilia, photos, and artifacts. I couldn’t look at the photos at all. When I entered to room with photos and artifacts at first I had to run out. After composing myself I tried again. I was able to view the artifacts but not the photos. Seeing a piece of “my” airplane led me to sobbing. I figure I’m not the only one, as there were Kleenex boxes placed in the room. I want to do go to a memorial or gathering to honor those lost, but I’m not sure if I can. I’m afraid I’ll have to run away sobbing. I definitely don’t feel ready to view the 9/11 Memorial at Ground Zero. I don’t know if I ever can do it. You would think that with each passing year this anniversary would be easier, but it’s not. Every year we flight crew members are caught by surprise by our reaction and emotions because each year they change and different things trigger a reaction. Right now I’m feeling dizzy as I try to find a way to summarize and close this post. I’m sure it’s not a healthy response, yet I just have to run away from the feelings once again. As memories and statements about 9/11 are spread across social media today I will go back and forth between scrolling past as fast as I can and reading with heartfelt response. I’ll want to talk about it one moment and then want nothing to do with it the next. I never know until that moment if I can handle the memories or not. The one thing that I do always know is that I cannot watch any of the footage from that day. The TV must be avoided altogether. And the movie? That’s something I know I can never watch. “I’ll want to talk about it one moment and then want nothing to do with it the next. Does any of this make sense to you? Can a response to great tragedy ever make sense? If you’re a crew member, are you able to face the memories brought up by visiting the 9/11 Memorial, or do you still have to avoid it like I do? Where were you on 9/11? Share your story in the comments below. What you have to say may be helpful to others.